Inspired by the natural forces of stack action, Airocle developed the innovative 5 Series for maximum roof-based ventilation performance. 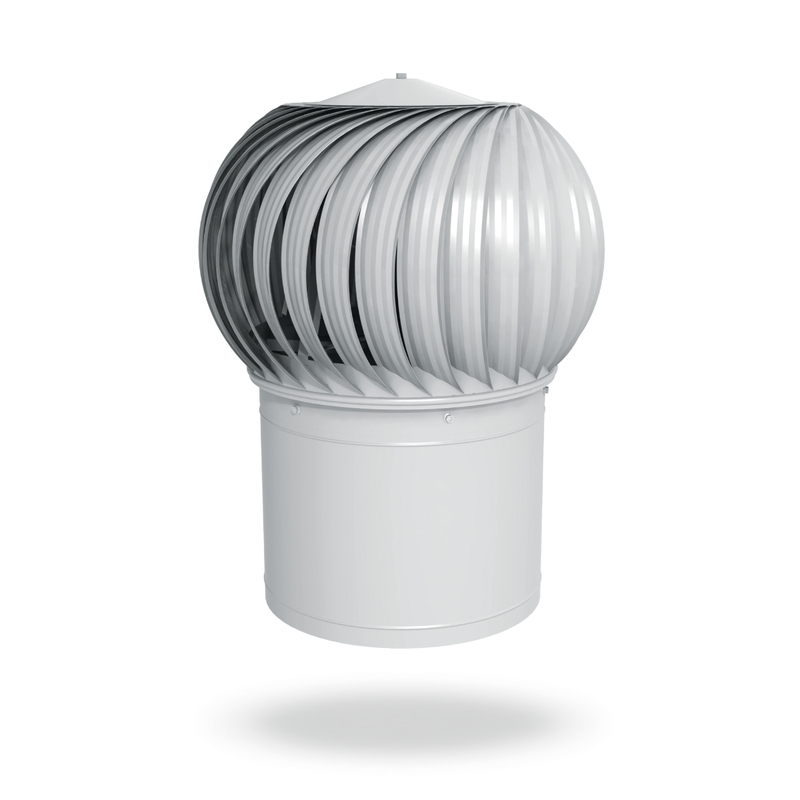 5 Series rotary roof rotary ventilators feature scientifically-engineered rotating heads offering an efficient, environmentally-friendly, reliable ventilation solution for boosting natural airflow from just about any building. High performance typhonic ball-bearing action enables even the slightest air motion to rotate the head, which creates a vacuum into which air naturally rushes into, offering optimum ventilation. Hot and contaminated air is expelled from your site into the outside atmosphere. Thanks to the ventilator’s innovative design there’s no chance of it funnelling back in. Airocle’s 5 Series roof ventilators are naturally powered – by cost-free air. They’re an economical ventilation solution suitable for a wide range of applications. Once installed, 5 Series ventilators are virtually free of running and maintenance costs. Airocle couples natural science with great design. Our 5 Series rotary roof ventilators look as good as they perform. Modern and unobtrusive design enhances the aesthetics of any project. 5 Series vents incorporate a number of superior design features, giving maximum efficiency and continual trouble-free service – even in adverse conditions. Corrugated roll-formed vanes provide strength, rigidity, positive air flow and weather-tightness. 5 Series vents are also available in a fire rated configuration, and have been tested to AS:1668.1.1998-4.8. The vents are tested to operate at temperatures over 300°C, for over 2 hours. Airocle 5 Series roof vents are fabricated from high-strength materials. Choose from Zincalume, galvanised steel, aluminium, stainless steel, or copper. Unique, ‘inverted cap’ design ensures the permanent alignment and strength of units. Discover how to further increase air flow via our engineered low profile rotary ventilator booster fan. The fan assists in removing harmful gases requiring accelerated extraction – such as welding fumes or exhaust emissions. Please note: Booster fans cannot be used for smoke-spill. Please contact Airocle to discuss options for smoke-spill solutions. 5 Series’ unique and innovative typhonic bearing system is sized to withstand many times the actual thrust loads carried. Careful balance and alignment assures quiet and vibration-free operation. Roof bases are required with Airocle’s 5 Series roof ventilators. These are precision-manufactured in five basic types to suit your job specifications and roof pitch. The units can be supplied coated in two-pack polyurethane to match Colorbond colours. NB: For ventilator throat sizes 500mm and over, additional support between purlins is recommended. For industrial and commercial building ventilation requirements, it is recommended vents be spaced approximately 6 meters intervals on the roof to provide an air change every 10 to 15 minutes. Larger buildings may tolerate a change of air every 30 minutes if conditions permit. 5 Series roof vents’ robust construction guarantees trouble-free, efficient ventilators. All are warranted for a minimum 10 year period. Our market-leading spherical-blade design has been rigorously tested and is supported by CSIRO and NATA approved laboratories. 5 Series ventilators are constructed to efficient design principles and powered by natural science. Our market-leading spherical-blade design has been rigorously tested and is supported by CSIRO and NATA approved laboratories. Once installed, there are virtually no running or maintenance costs to worry about, making our 5 Series rotary roof ventilators an excellent choice for a sustainable future. With more than 30 years in the business, our ventilation experts are available to advise on the most efficient design for your project.